A client event is a great way to strengthen client relationships, meet prospects, and market services to your target audience. But given the time and effort it takes to plan, organize, and execute, how can you ensure that your event is successful? The answer (although it may seem obvious) is to find the right client event idea. After all, most clients and prospects won't attend a function that doesn't seem educational, fun, or a worthwhile use of their time. Looking for client event ideas? Download our free list of marketing ideas to make your next event both fun and memorable. To find the right event idea for your firm, it's important to determine the specific business goals you would like to achieve. For example, an event held with the objective of expressing gratitude to clients will be very different from one with the purpose of educating clients or gaining introductions to prospects. The chart below offers a detailed look at some common business objectives, plus a few event ideas. Once you've determined your event's objective, it's time to get down to thoughtful, strategic planning. 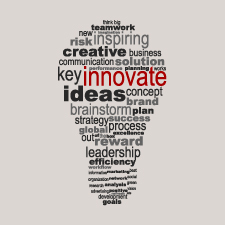 The best practices discussed here will help you solidify a great idea and put it into action. Consider your personal passions. Build events around whatever you're passionate about, whether that's cooking, fishing, painting, or playing golf. Remember, if you're an enthusiastic host, this will go a long way toward making real connections with prospects. Find commonalities. Once you create your guest list, take the important step of grouping invitees based on commonalities. That way, you can design events that cater to specific personalities, interests, or challenges. Leverage wholesalers. Do you have relationships with local wholesalers at mutual fund and other sponsor companies? If so, leverage them to learn what resources may be available to you at a lower cost. Hire a speaker. Sometimes, hiring a high-profile speaker for a large-scale event is an effective way to attract your ideal client. A speakers bureau can help you find all types of speakers (e.g., motivational, sports, and wellness), but keep in mind this approach can be costly. Go local. One popular idea that has worked for many advisors is to hold events at local venues. Here, research museums or sports facilities in your community. You might even be able to hold your event in conjunction with goings-on in your area (e.g., Independence Day fireworks display). Focus on emotion. For educational events, consider topics that stir an emotional response. For example, if you're hosting a presentation about retirement savings strategies, don't focus solely on the technical mechanics of developing an income plan. A balanced discussion about the risks of running out of money or paying out of pocket for health care may elicit a stronger reaction—and the impetus to take action. Whatever its purpose or location, a client event is all about creating an environment where you can connect with your guests in a meaningful, memorable way. By following the best practices outlined here, you'll be well on your way to turning your great idea into a successful client event. 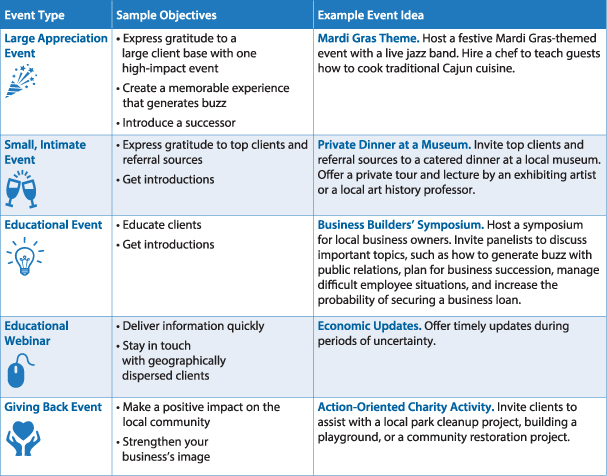 What other best practices do you follow when planning a client event? Have you held an event that was a hit with clients? Please share your thoughts with us below!